Virtual Reality (VR) has been a flourishing phenomenon for quite a period of time. It is basically a three-dimensional, computer generated environment which can be explored and interacted with by a person by becoming a part of this virtual world. The three-dimensional images appear life-sized to the person. They change as the person moves around their environment which corresponds with the change in their field of vision and follows phenomenon of change in perception. This ensures that the virtual environment is both realistic and enjoyable and so virtual reality is becoming the next big thing in entertainment. 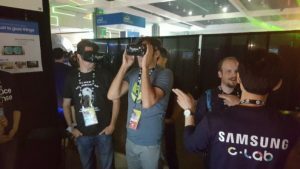 Samsung has been continuously experimenting with VR technologies to make the platform more accessible and immersive. During the VRLA Expo 2017 in Los Angeles, the world’s largest virtual reality (VR) and augmented reality (AR) exhibition, a group of Samsung employees introduced an experimental, hands-free VR interface called as FaceSense. FaceSense, a product of Creative Lab which is Samsung’s startup business program presents a new approach to VR navigation by tracking movement in the user’s face. Whenever we speak, change our expression or shift our gaze, our faces generate electric signals. 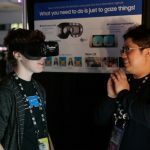 FaceSense recognizes and translates these biometric signals into input for navigation, allowing users to maneuver through VR worlds with intuitive movements and simple voice commands instead of out-of-sight physical controls. 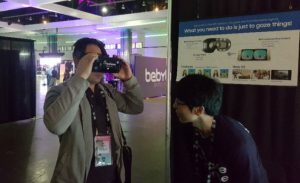 The prototype showcased at the exhibition was designed for Samsung’s Gear VR headset.